Eric Haugesag (How' guh sog) sings, plays the guitar, writes all the songs. He's 25, but looks 12, except for a world-weariness that's somehow crept into his eyes. He comes from a very musical family; he learned to play bass before he could even pick it up. The first song he wrote included lyrics like "Your wife is gaudy/And her doggy's naughty". He ties his showlaces different from anyone else in the world. Chris Nygaard (Nye' guard) plays bass. He's 22, but he too looks younger. He began playing bass right out of high school. This is his first band He met Eric when he went to school with his brother. Chris thinks Playhouse should be Rock Gods by now. They will be. Stefan (Ste' fan) Sarles is the drummer. He's 23. He also looks younger than that, but not too much because he's so tall. He's known Eric since nursery school, although they weren't friends unitl later. He was in bands in Madison, Wisconsin, where he went to college. Now he 's in law school. Stefan's arms whirl all over the place, creating maniacally paced drum rhythms. Chris' melodic bass lines keep right up with the pace, whiel Eric's guitar creates a noisy, frenzied overlay that never lets up. the resultant sound is alternately furious and delicate; songs ebb and flow, bounce, rage, and float. Jittery garage pop that's funk-tinged and even sllightly psychedelic. No joke tunes for this band, thier songs are about things like the atrophied state of the music scene, nuclear holocaust, and how people treat each other, and sung in Eric's hoarse vocals. Eric listened to a lot of jazz while growing up, but he's more influenced by the structure and logic of it than the sound. He's influenced by everthing he hears, even bad bands, because they inspire him to be better than them. The band formed in December of 1985, although Eric and Stefan had jammed together years before that. In April, 1986 they played their first gig, on Stefan's birthday, at Club Degenerate in the Seventh Street Entry. They were asked back right away, and the next month they opened two shows for the Meat Puppets. That fall they saved their pennies and recorded an 8-track demo tape with Dave Pirner from Soul Asylum producing. 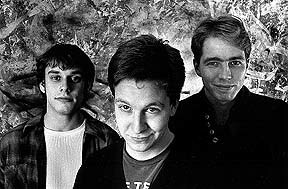 Pirner also co-produced the debut EP, with the band's soundman Terry Karkanen. This is Pirner's first crack at producing. "In order to have a biography you must first have a past. Playhouse has no past, we're as innocent as a little puppy. Just Wait."